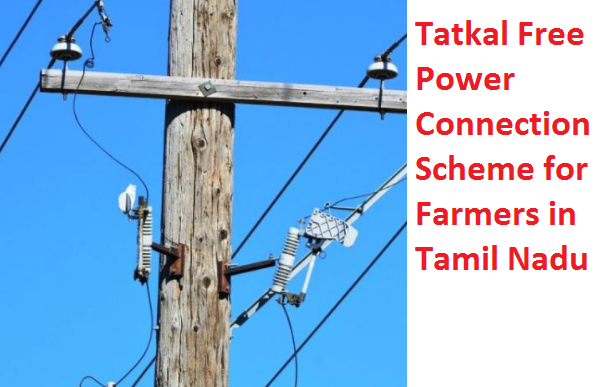 The state government of Tamil Nadu has finally launched the Tamil Nadu Tatkal Scheme for power connection. In this scheme the farmers of the state will get electricity for free. Some terms and conditions must be followed by the farmers to get the benefit of the scheme. Farmers will have to pay a specific fee under the scheme to get the benefit of the scheme. The scheme Tatkal has announced by the state government of Tamil Nadu during the middle of the year 2017. During the last week of the month of November 2017, the scheme has officially launched by the state authority. Tatkal Scheme: Tatkal Scheme is the part of Agricultural Service Connection. Under this connection service the state will provide electricity connection to agricultural sector for the betterment of the farmers. Under Tatkal Scheme the farmers will get electricity within this year that is 2017. Objective: The main objective of the scheme is to make better life for the farmers. Under this scheme places where no electricity has reached will get smooth and round the clock power connection. Beneficiaries: The farmers of the state will be the beneficiaries under this scheme. According to the authorities approximately more than 50,000 connections will be provided to the agricultural areas across the state. Already nearly 3500 connections have been provided by the state electricity board. Fee: There are three types of fees under this scheme. Basically the beneficiary will have to buy the motor to get the free connection. There are three types of motors available under Tamil Nadu Tatkal Scheme. Depends on their power, 3 types of motors such as 7.5 HP motor, 10 HP motor and 15 HP motor are available. The fees for each are 2.5 Lac for 7.5 HP, 3 Lac for 10 HP and finally 4 Lac for 15 HP respectively. Supervision: Tamil Nadu Generation and Development Corporation will supervise the project. They have already received more than 20, 000 application forms as of now for the meter and connection under the scheme. One Day Connection Schemes: In another report the state has stated that they have started another scheme where domestic consumers will be able to get power connection within a day time. Under this scheme the state have already provided 85, 000 connections to places across the state. More Schemes: Apart from electricity connection, the state government of Tamil Nadu ahs started many other schemes for girls, poor people, widows, farmers, students and homeless or people who don’t have their own house. Tatkal scheme is only for the farmers of the states. The scheme will be implemented in rural and agricultural area only. However not all farmers are eligible for the scheme. Those who are willing to buy the motors or willing to pay the fee will only be eligible for the scheme. The farmers will have to be the citizens of Tamil Nadu. Ration card, aadhaar card or voter ID card of the beneficiary must be submitted as the nationality and address proof of the beneficiary. To get the benefit of the scheme the applicant must apply for the same. To apply for it they have to download the form and submit it to the proper office. Only online forms are available for the scheme. To get the online form one must click on the following link http://www.tangedco.gov.in/linkpdf/Agri%20-Form.pdf. The form will be appeared in PDF format. The beneficiary will have to download the Form 2. There are also the guidelines that are written on the first section of the form. Beneficiaries need to read them carefully before applying for the scheme. In the form there are few places that must be filled. Name, area, residential address, district, taluk, village names, motor details and the names of the partners or owners including their signature are mandatory to enter in the form. 50/- is the application fee that all the applicants have to deposit at the time of form submission. Applicant has to download the form, take a print out, fill it up with correct information and finally submit to the executive engineers or in the operation and maintenance office in the districts. Tatkal Scheme has announced a long time back and immediately applications had started coming in. However no motor has been installed until now. Many questions regarding the same have arrived before that applicants neither received the motor not got any connection. Now the authority has said that within few time 50,000 connections will be provided in the state across the agricultural area. For more details about the scheme one can visit their official website http://www.tangedco.gov.in/.